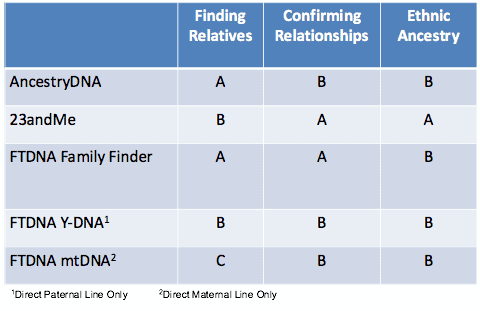 How do you know which DNA test to order? This DNA Test Report Card can help you decide. I give A, B, or C grades to each of the five most popular genetic genealogy tests on three distinct functions. You decide which functions are most important to you and look specifically at those grades. A lot of people are confused by the names of the companies and the names of specific tests. The following table makes it clear. The company names are in the first column. The next three columns are the three test types. Reading from the table, you can see that Ancestry offers one test, an autosomal test called "AncestryDNA." 23andMe also offers an autosomal test. Family Tree DNA offers all three test types and their autosomal test is called "Family Finder." Altogether there are five very popular tests to consider, each marked in the table with a star. These are the tests that I grade in my DNA test report card. Whether you’re a genealogist or an adoptee, the first function of genetic genealogy is to find previously unknown relatives. The testing company will compare your DNA with that of everyone else who has already taken the same test and will continue to compare you with new people who take the test for years to come. The biggest database already has two million testers and all of the databases are growing rapidly. Each test will identify people who have significant amounts of DNA in common with you. All but the most speculative matches share a common ancestor with you. Some of your matches will have online family trees. You can also contact matches to open up a dialogue. Either way, you can learn something new about your family tree. The second function of genetic genealogy is to confirm that two people have ancestors in common. By actually measuring how much DNA two people share, autosomal DNA tests can confirm or disprove any suspected relationship from any branch of the family tree out to the second cousin level. Y-DNA testing can prove that the direct paternal lines of two men must intersect at a common male ancestor. Mitochondrial DNA testing can prove that the direct maternal lines of two people (male or female) must intersect at a common female ancestor. Y-DNA and mtDNA testing identify your haplogroups, which define the ancient ancestry of your paternal and maternal line ancestors. Every one of these tests can add value. And each one has unique strengths. But when you focus on one function at a time, some tests have a better chance of producing useful results than others. That’s why a DNA test report card is needed. To keep things simple, I have assigned letter grades of A, B, or C.
An “A” grade identifies a great test for a particular function. The “B” grade means the test can still be quite useful; but it is just a step below a test graded as "A." The “C” grade means your chance of getting useful information for that function is limited. Note that these are my personal opinions based on years of family testing and feedback from many other users. While many genetic genealogists would probably agree with my grades, I do not expect everyone to agree with every grade on my DNA test report card. Also note that luck is always a factor in any one person's results. That's why you will hear vastly different reports on the effectiveness of each test. My grades are based on the average experience of many testers. But your experience may be different. To keep this brief, I will only explain the grades that stand out as exceptions. Even though many factors go into my grading, I will only point out the major factors that resulted in a higher or lower grade. 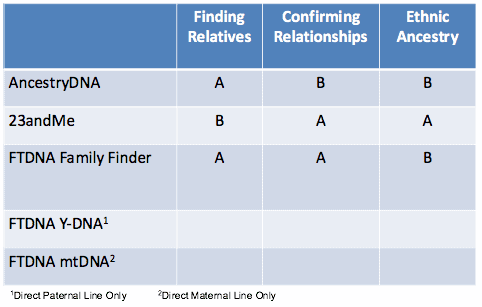 Finding Relatives: AncestryDNA and Family Finder earn “A” grades. 23andMe only gets a “B” at Finding Relatives. Some 23andMe users test primarily for health reasons and they tend to be less responsive to genealogy inquiries and less knowledgeable about their family trees. Confirming Relationships: This relationship testing function is especially useful for adoptees who believe they have found a relative from their first family. 23andMe and Family Finder earn an “A.” But I mark AncestryDNA down to a “B” because it does not reveal segment data or provide a chromosome browser. Measuring Ethnic Ancestry: 23andMe earned the only “A” grade for two reasons. First, it uses an innovative extra step to provide a slightly more detailed regional breakout. Secondly, it’s the only autosomal test that also reports your haplogroups. While this falls way short of the specific Y-DNA and mtDNA tests at Family Tree DNA, it is a nice add-on for those who don’t plan to do the more specific tests. Confirming Relationships: These tests can confirm that two people must have shared a common paternal or maternal line ancestor at some time. However, they cannot confirm how many generations back that common ancestor lived. So I give them both a “B” on confirming relationships. Measuring Ethnic Ancestry: Y-DNA and mtDNA tests identify your haplogroups, revealing the ancient migration paths of your direct paternal and maternal lines. Certain haplogroups will confirm Native American ancestry. Since these tests are more narrow in scope than autosomal DNA tests, I give them each a “B” grade on this function. NOTE: Family Tree DNA is the only company I recommend for Y-DNA and mitochondrial DNA testing. The following table summarizes all 15 letter grades by function and test. My suggestion is to decide which functions are important to you and then start with a test that gets the best grades for those functions. Since the autosomal databases are mostly comprised of different people, adoptees and many serious genealogists will ultimately want to get into all three databases. Yet my DNA test report card can help you decide where to start. You can also learn more by browsing the other pages on this web site.